Registration: Space is limited; advance registration required. Register by phone at 414-446-8794, or at the front desk day-of. Wet felting transforms fluffy wisps of wool fibers into a durable, insulating textile. 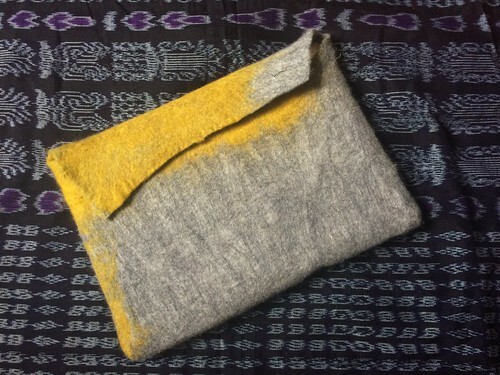 We will use the technique of wet felting to turn wool fibers into bags and pouches--from coin purses and pencil cases to laptop cases. In this workshop we will use our arm muscles to agitate the fibers, causing them to fuse together as they shrink and condense. You will leave the workshop with a beautiful, functional, and durable bag of your own design. No experience required (though you will need to stand and exert yourself physically). Aprons provided; please bring a towel and a lunch. Claire Hitchcock Tilton is an artist, designer, and grower from Milwaukee. She works in many fine art and craft media from weaving and woodworking to painting and gardening. Hitchcock Tilton’s work explores the different ways the rural and urban landscapes affect her relationship to the land. She has studied weaving traditions with Navajo master craftswomen, and fibers, ceramics and woodworking at the Oregon College of Art and Craft. She received a BFA in Integrated Studio Arts from the Milwaukee Institute of Art & Design. Hitchcock Tilton’s time is split between managing the grounds of the Lynden Sculpture Garden and working in her Milwaukee homestead and studio.